Moving effortlessly between grand piano, custom built electronic keyboards and mighty Wurlitzers, Jean often comes on to the stage still deciding whether to stun listeners with a breakneck ‘William Tell Overture’, or stir up passions with the unforgettable ‘Dambusters March’. Jean’s range of music is vast, ranging from classical composers to modern day music but she excels herself when playing her own magnificent arrangements of music from the 40s. It is impossible to pigeon-hole Jean’s style and keyboard artistry, except to say that it is most often allied to that of Errol Garner, but with extra fingers. She is equally capable of moving romantic interpretations in the style of Richard Clayderman, and ‘upping the ante’ a la Russ Conway or even Fats Waller. Flexibility, is the hallmark of Jean’s performances, which draw their musical depth from her extensive classical training, yet she can embrace the dexterous Jazz and Big Band influences that are natural for a performer who has played with the famous James Last Orchestra and also at Ronnie Scott’s Jazz Club. She is often sought after as a BBC session player on recordings and Jean has been playing professionally for more than 20 years. She began playing at the age of three, playing nursery rhymes on her parents’ piano. She comes from a very musical family, both her mother and grandparents being musical. Her natural musical ability began to show at the age of five. Her parents sent her to a music teacher who put her through her grades on the piano, then through Trinity College of Music in London, of which she eventually became an Associate. At the age of eleven, Jean was appointed organist at her local church and even now, when time permits, plays there when the organist has some time off. Jean has travelled the world, entertaining people with her unique and remarkable style. She has played alongside many famous artists such as Ken Dodd, Vince Hill and Chris Tarrant. 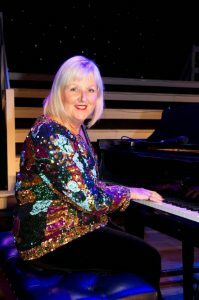 Jean is sought after by organ societies throughout the UK on a regular basis and has also been booked to play in America, Germany, Italy, Holland, Switzerland and Turkey. Jean supports various charities and has raised lots of money for cancer and blind societies. Her many recordings on CD demonstrate her talents on piano, electronic organ and of course her third love, the theatre organ. One of her favorite recordings was made on the Blackpool Tower Wurlitzer. She is the only lady organist to have recorded at the tower in the last 50 years.